Many adults don’t want to have their teeth straightened because they don’t want traditional braces. Those ugly metal wires and brackets are uncomfortable and take two or three years to deliver results. The good news is that there is another alternative. Invisalign invisible braces straighten teeth in about half the time of conventional braces. And one of the best parts is that from a conversational distance, no one will notice you are wearing the clear aligners. As a Premier Invisalign Provider, Dr. Coleman has received the proper training to successfully use this innovative system. Developed in the 1990s, Invisalign uses highly sophisticated technology to straighten teeth using precise computer-generated movements. A series of clear aligners are manufactured to fit snugly over your teeth. Over time, they will gradually correct the position of your teeth. All you have to do is insert a new set of aligners every two weeks, until the desired results are achieved. When Dr. Coleman has determined that you are an Invisalign candidate, he will perform an initial examination and a full set of x-rays. 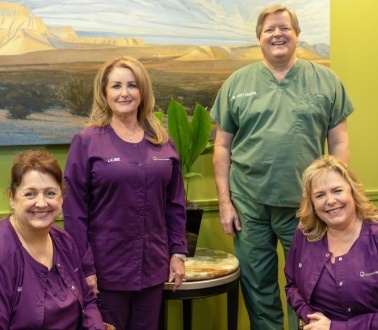 During this comprehensive exam, Dr. Coleman will analyze your overall dental health, the current position of your teeth, as well as the shape of your tooth roots. All of this information is taken into account in achieving a beautiful, straight smile. A mold of your mouth will be taken and scanned into the computer. The laboratory will use this information in the creation of your individualized set of aligners. When the aligners are back from the laboratory, you are ready to begin. Simply snap them in place over your teeth. At first, you will notice that they feel a little tight. This is intentional. The aligners have been designed to gently start repositioning your teeth into a different position. In a few days, the first set will feel like they fit, and in two weeks it will be time for a new set. This new set will again feel snug as they continue to move your teeth ever so slightly. This process is repeated every two weeks until your teeth are straightened. This system has an extremely high patient satisfaction rate – one of the highest of any dentistry treatment. These invisible aligners are just that – invisible. No one can tell you are wearing them. You can remove the aligners before eating, drinking, and brushing, so this system does not interfere with your food consumption or at-home dental hygiene. Invisalign is much more comfortable than the traditional wire and brackets. It is much faster, too. Instead of two to three years, it only takes about one year to straighten teeth with Invisalign. In some cases, it may take closer to six months. If comparing fees, Invisalign is a little bit more expensive than traditional orthodontics. In order for this treatment to be successful, strict patient cooperation is required. So if you don’t follow instructions well, Invisalign may not be right for you. The teeth need to be fully erupted. Since a teenager’s teeth may not be fully erupted, traditional braces may be the better choice for teens. If you are interested in a comfortable, fast, invisible way to straighten your teeth, give us a call and schedule your consultation. After a brief five-minute chat with Dr. Coleman, he will be able to help you determine if you are a candidate. Call us at 713-783-2800 or visit our make an appointment page today.